"Stop the Siege of the Syrian People"
A framed picture lies amid rubble in Damascus, Syria, on 27 July. Christian patriarchs residing in Damascus urged the international community to “stop the siege of the Syrian people” and to lift international sanctions, which they say are deepening the suffering. Christian patriarchs residing in Damascus urged the international community to “stop the siege of the Syrian people” and to lift international sanctions, which they say are deepening the suffering. “Despite the resolution of the Syrian people in the face of the crisis, the social situation is getting worse and the poverty and suffering of the Syrian people are constantly increasing,” the patriarchs said. The patriarchs said that in addition to helping to improve the dire living conditions in Syria, lifting the sanctions would facilitate efforts of church and humanitarian groups in providing aid, thus reducing exploitation of the suffering Syrian people. A day earlier, in a meeting with Russian Ambassador to Syria Alexander Kinshchak, Patriarch Aphrem requested Russia’s help for the release of two kidnapped archbishops of Aleppo. Syriac Orthodox Metropolitan Gregorios Yohanna and Greek Orthodox Metropolitan Paul, brother of Patriarch John, were kidnapped in April 2013 in northern Syria while on a humanitarian mission. Members of Free Syrian Army (FSA) patrol part of Aleppo, Syria, after taking control from ISIS terrorists during ‘Operation Euphrates Shield’ on 24 August 2016. On Saturday 20 August 2016 King Mohammad VI of Morocco joined a growing list of Muslim leaders to condemn what is often referred to as Islamic terrorism or extremism. The speech was delivered on the occasion of the 63rd anniversary of the Revolution of 20 August, in which Morocco gained its independence. As one continues to hear “why don’t Muslims speak out against terrorism?,” King Mohammad VI adds his voice to a long list of Muslim leaders — many unheard in the West — who have condemned extremism and religious terrorism in the strongest terms. He joins the ranks of those courageous Muslims who have condemned what is being done in the name of God and Islam. Muhammad Haniff Hassan and Mustaza Bahari, two Muslim scholars, have published a list of 86 organization and individuals who have spoken out against ISIS, containing statements made by the Grand Muftis of Syria, Iraq and Saudi Arabia, the political leaders of Indonesia, Malaysia, Morocco, Saudi Arabia and Iran together with numerous Islamic universities, societies and individual scholars. But perhaps the strongest reaction can be found in the form of an open letter to “Dr. Ibrahim Awwad Al-Badri, alias ‘Abu Bakr Al-Baghdadi’ and to the fighters and followers of the self-declared ‘Islamic State.’” Published on 19 September 2014, the letter uses the method of traditional Islamic jurisprudence to condemn ISIS. Meanwhile, setting a more constructive tone, the Declarations of Marrakesh (25-27 January 2016) and Erbil (2-4 June 2016) outline in detail how Muslims can and should live in a pluralistic world. In this image from 2001, Mar Varkey Vithayathil ordains Mar Jacob Angadiath as bishop of the Eparchy of St. Thomas. 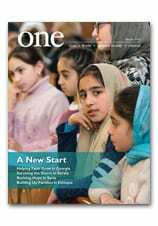 To learn more about the rich history of the Syro-Malabar Catholic Church, check out our profile of this Eastern church in the January 2007 edition of ONE. In this image from 1 August, a woman in Donetsk, Ukraine, is seen in her apartment damaged by a shelling attack. Pope Francis on Wednesday issued an appeal for peace in Ukraine.